Drum Corps International is teaming up with corporate partner AeroBed to offer you the chance to win incredible prizes as part of the AeroBed "Dream Anywhere" Video Contest! We want you to create and submit a 30-second YouTube video telling the world why you love your AeroBed or why you need one! Be the star of your own video, or team up with fellow corps members, friends, or other drum corps fans to spotlight how great it is to get a good night's sleep after a long day of practice or watching your favorite performances from the stadium. Your entry must be submitted to Drum Corps International by uploading the video to your own YouTube account, then e-mailing aerobed@dci.org with your name, e-mail, postal address, and the name of and link to your video. (Minors must also include parent or guardian's name, phone number and e-mail address) We'll then add your video to the AeroBed "Dream Anywhere" Video Contest playlist. Submissions will be accepted between May 20 and June 15, 2009. Videos should be 30 seconds or less. Creatively tell us how much you love your AeroBed or why you need one. Make sure to mention AeroBed.com in the video. Bonus points for incorporating a fun drum corps theme to your video! Be funny, but be smart. We LOVE to laugh, but G-rated material only please! Submissions must have copyright permission for music or images that are not original. Contest is offered and open only to legal residents of the United States. Employees and the immediate family or members of the households of such employees of Aero Products International are not eligible. More than one entry is allowed per person, so get busy! Winners will be announced on DCI.org after June 15, 2009. Please read the official contest rules. 1. Best of Class: Chosen by a panel of AeroBed judges who will evaluate videos based on creativity and contest criteria. 2. People's Choice: The video that generates the most views on the YouTube playlist by June 15 will be named the People's Choice winner. Best of luck and have fun creating your videos! Read the official contest rules. 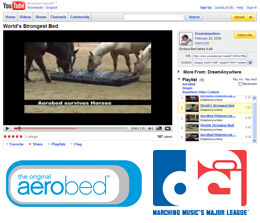 Check out the AeroBed "Dream Anywhere" Video Contest playlist on YouTube. Save 40% on select AeroBed products through May. Visit AeroBed.com.